Since people seemed taken with the beautiful building housing the National Arts Club today on Gramercy Park South, I thought I might mention some other important art societies in New York– these for artists, not just art collectors and enthusiasts (like the National Arts Club), in New York: the National Academy of Design, and the Art Students League. The National Academy of Design (NAD) was the arbiter of artistic expression in the United States through the early 20th century. NAD promoted the “academic” tradition in Europe, which during the nineteenth century favored history painting above all others. For a time, the NAD was located just around the corner from Madison Square Park, which we visited today. 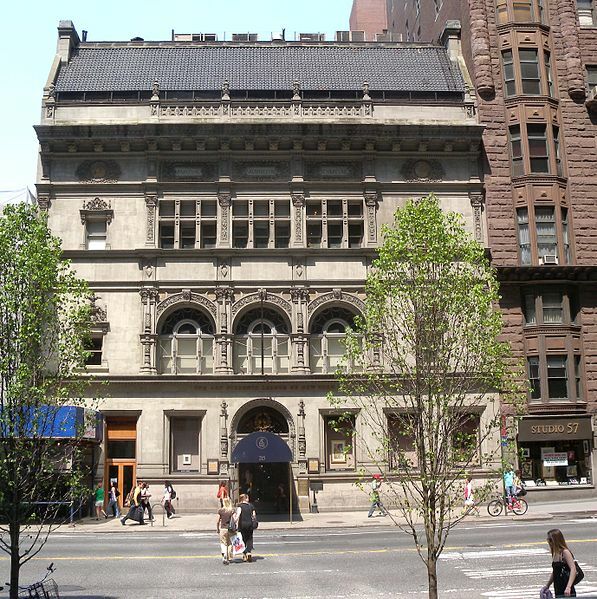 It’s now located at 5th Avenue and 89th St.
Home of NAD from 1863-1865, near Madison Square. The other art society that might be of interest to some of you, especially those working in the 20th century, is the Art Students League. Pretty much anyone who was anyone in 20c American art either taught or trained at (and probably lived at) the Art Students League, which for much of its existence has been at West 57th St., where it continues to exist today. The Art Students League was friendly to radical politics and artistic experimentation, and functioned as a sort of incubator for many 20c art movements, including those affiliated with (dare I say it?) modernism(s). Art Students League building on West 57th St. Photo by Jim Henderson. Locations & pics have been posted to Historypin, but I thought I should mention these organizations on the blog since they provide useful context for today’s tour, and I don’t see them included on any of the other walking tours planned for CoP. These organizations contrast with the National Arts Club because they included artists, not just patrons– though the NAD also included many patrons, including, I would assume, many if not all of the members of the National Arts Club. Janice may be able to expand on this last point. 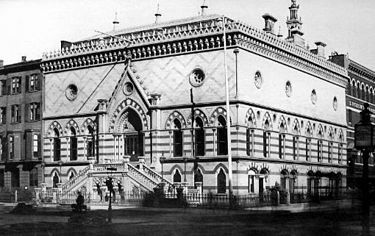 It should be noted that the Art Students League was not the only art school operating in the U.S. during the 19th century. The Art Institute of Chicago– whose curriculum was based on the academic painting tradition– trained many of the artists and illustrators who appeared in New York periodicals in the late-19th and early-20th centuries, as did art schools in Cleveland, San Francisco, and elsewhere. Sloan and Glackens took instruction at Philadelphia’s Pennsylvania Academy of Fine Arts (PAFA), where Thomas Eakins–advocating his brand of realism-observed-from-life rather than the academic tradition, which had students drawing and painting from plaster casts– briefly taught in the late-1880s or early 1890s. 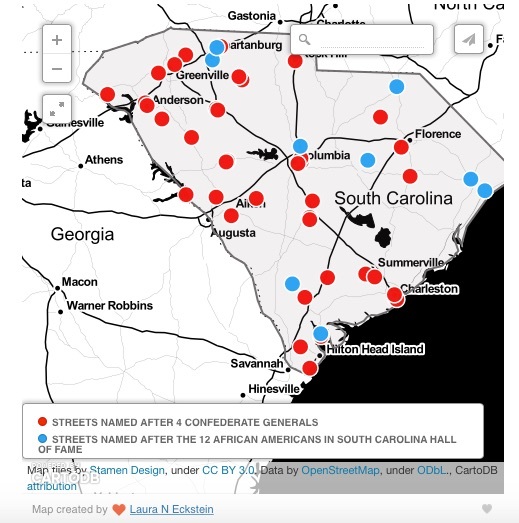 From “The Confederate Streets of South Carolina” at lauraneckstein.com. While the map raises as many questions as it answers (are the streets in prominent locations, or on back roads? Are they single-block “commemorations,” say, marking the block where a historic figure was born, or miles-long thoroughfares or highways? and so on), it make visible, in a powerful way, what “racial wallpaper” looks like. At the end of another blog post, this one written by my friend (and South Carolina literary historian) Susanna Ashton, of Clemson, a commenter pointed out that Dylann Roof also happens to live very near a street named “Chain Gang Road.” I used to live on Joe Sayers Avenue in Austin, TX, a street named after a Jim Crow-era governor of Texas (and, I now discover, a major in the Confederate Army). I always hated giving out that address and was glad to leave it behind. But at least it wasn’t “Chain Gang Road.” Can you imagine what it says to choose that name for a road– much less be proud to live or work there? Or possibly, it just got that name because it described what happened there. But the fact that it stuck says a lot, none of which I’d be proud of owning. I had always assumed that cities that used alphanumeric systems to name streets did so simply out of a desire to impose order on the grid, to make cities easier to navigate. But perhaps it also is an indication of an ideological fractiousness within a city, one that would make attaining consensus on street names impossible. Or it might hide that fractiousness altogether under a veneer of an orderly grid. Everyone says New York is so easy to navigate, because it’s all numbers: streets going south-to-north, avenues going east-to-west. It may be easy to navigate, but it also “depersonalizes” or maybe even “dehumanizes” the city as well–perhaps for ideological reasons– does it not? After Janice Simon’s entertaining and eye-opening <groan> session on visuality and looking in periodicals, I decided to take a little break from print yesterday afternoon and spent some time at the Met. But what did I encounter there? You guessed it–more print culture. 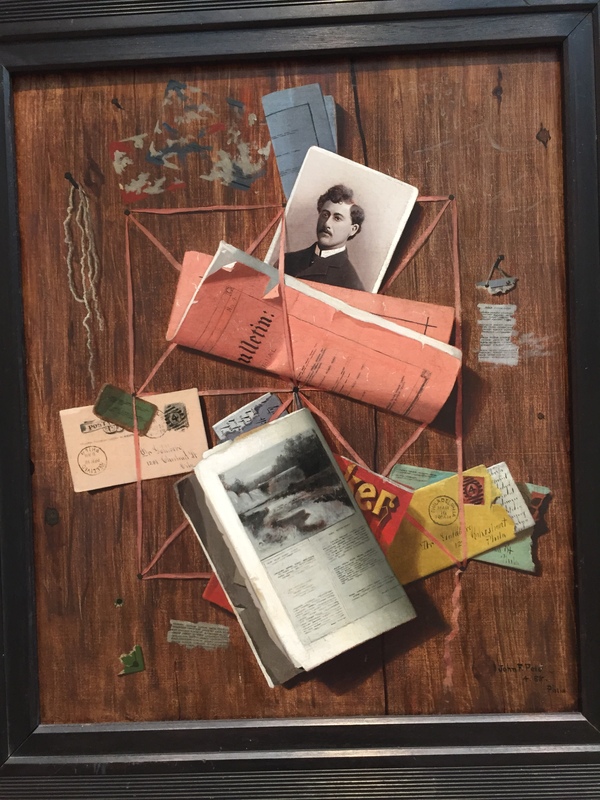 If the late-19th century was an age of ocularity, it was also an age of print, and nowhere do the two merge more evocatively than in the late-nineteenth century trompe l’oeil paintings of John Haberle, William Michael Harnett, and John F. Peto. 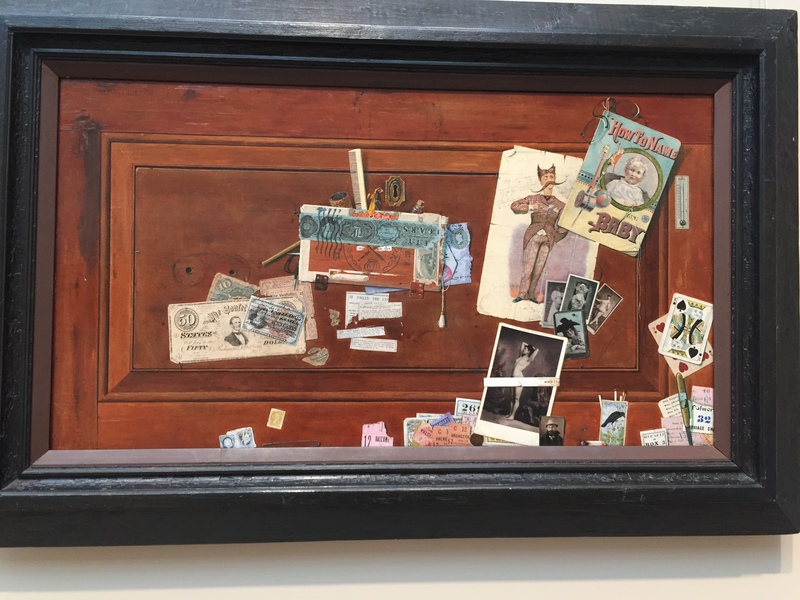 In the painting above, Haberle reproduces, in an evenly flat, painted surface (no impasto here), a drawer front; but if you look closer, you’ll see that what Haberle has actually painted is a painting of the front of a drawer (the brown frame immediately inside the black one is, in fact, painted). Haberle, who was trained at the New York Academy of Design, was known for playing these kinds of visual jokes on the viewer, and this painting is full of them. While many of these jokes are based on visual tricks, many others incorporate elements of print culture– newspaper clippings, postcards and chromos, playing cards, ticket stubs, and money. In fact, Harnett and Haberle’s depictions of currency were so convincing that both of them were issued cease-and-desist orders by the government. 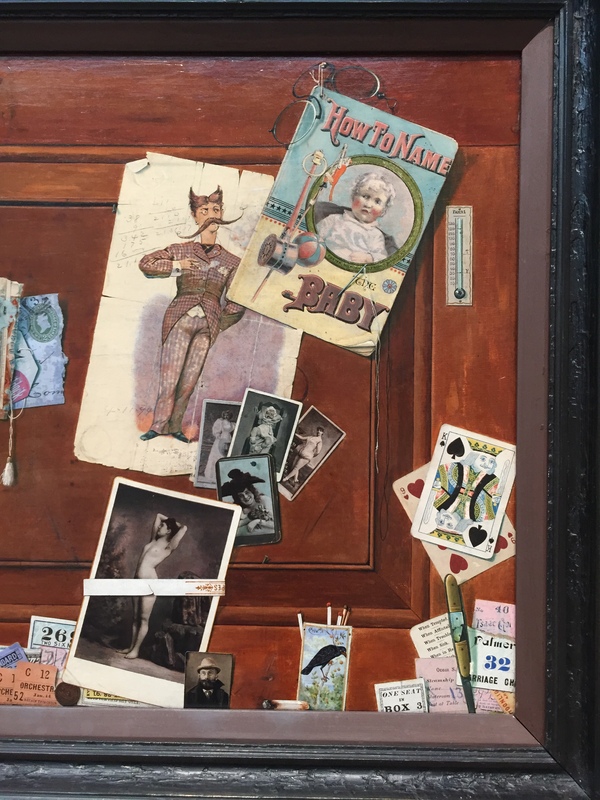 Perhaps the reason why the trompe l’oeil painters incorporated so much print culture into their paintings was because they were two-dimensional, thus lending themselves to visual trickery. In a way, it was kind of a cheat: easier to paint a 2-dimensional thing in two dimensions, right? But there’s more going on here. The artists assign great significance to these seemingly ephemeral, throwaway objects, and take great care in depicting printed matter. Peto used periodicals themselves to great effect in limning the supposed owner of his Office Board, one of a series of paintings that were often commissioned by their subjects. These were a different kind of portrait, one that demonstrates a perceived connection between mass print culture and individual identity. This is a “portrait” of a Philadelphia chiropractor, Bernard Goldberg; his photograph is ostensibly tucked behind a scientific journal at the top of the painting, while a couple of other magazines are tacked on underneath. Maybe some of you can identify these periodicals. A gold star to anyone who can identify the newspaper from which the partially effaced clipping affixed to the right side of the board was snipped! 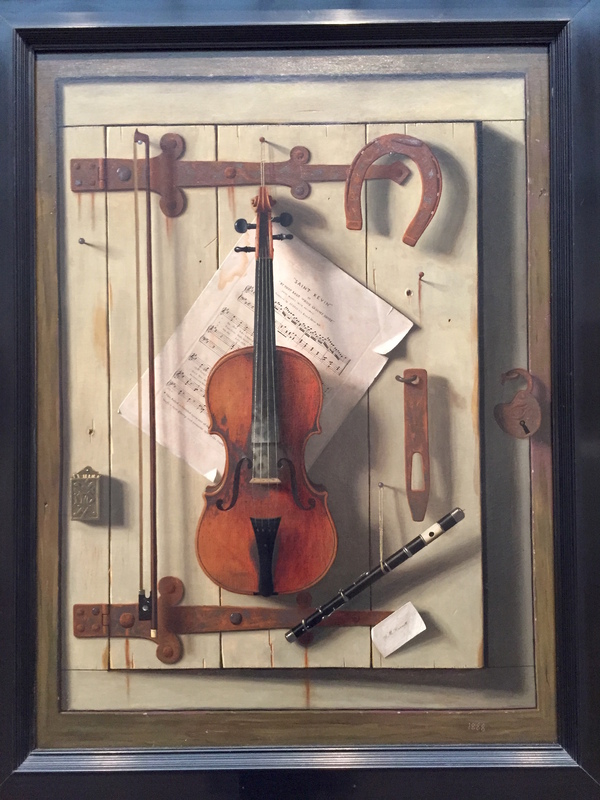 Harnett’s Still Life–Violin and Music (1888) also recalled Jennifer & Norma’s presentation yesterday of the 19th-century “ladies'” (or ladie’s, if you prefer) magazine and the inclusion of sheet music within periodicals. Behind the violin, Harnett has carefully reproduced the music for a popular song, “Saint Kevin,” adapted from Thomas Moore’s poem “Glendalough.” If you look closely enough, you will see that Harnett has taken pains to include the publisher of this music, J. J. Daly, located at 419 Grand St., NYC. Sheet music was included in many 19th-century periodicals; the early Sunday newspaper supplements that jacked up the circulation of Pulitzer’s New York World and Hearst’s Journal included them as well, bringing the latest tunes from the Tin Pan Alley music-making machine (not to mention the poetry of Victorian England) to the pianos of middle-class America. Incidentally, pianos, like bicycles and cameras, were advertised heavily in turn-of-the-century American periodicals as markers of status. Sheet music: yet another overlooked component of both print culture and periodical culture, especially in New York, which produced so much of it. I was talking with Kelly during our surprise wine-and-cheese reception at John Jay College and she suggested that in thinking about a term that might, more accurately than “print culture,” encompass the different forms of periodicals and their intersections and interactions with other cultural forms, we might think about “media ecologies” or “media systems.” I like these terms. What say you? As someone about as unfamiliar with NYC as it’s possible to be, my goal for this Institute is to try to get a better understanding of the patterns of movement, circulation, and intersections among a group of late-19th & early-20c artists, illustrators, cartoonists, writers, and publishers whose interactions I’m attempting to reconstruct for my current book project. They include some pretty well-known figures (R. F. Outcault, Abraham Cahan, Charles Dana Gibson, Stephen Crane), and some who were well-known in their day but since forgotten (Myra Kelly, Bruno Lessing/ Rudolph Block, George Luks), and some about whom I’ve been able to find little information at all (E. R. Lipsett and W. D. Stevens, to name two). One resource that I am hoping to use as a kind of “roadmap” for at least some of these interactions is the almost daily diary of one of this group’s most interesting figures, the painter John Sloan, who was affiliated with the so-called Ashcan School led by Robert Henri and exhibited (as did many of the other Ashcan-ers) in the Armory Show of 1913. In his diaries, Sloan describes his day-to-day activities in painstaking detail: what he painted, what he sold, everyone he met with or talked to. It’s one of the most complete documents we have of what it meant to be a professional artist in the United States during this period. As a follower of Henri, Sloan painted in a realistic style, and he painted many urban NYC scenes during his time here. The mapping impositions that Paul showed us today on Historypin are very much like the amazing then-and-now painting/photo comparisons on the John Sloan’s New York website; here’s one example that I stole from the site, images of a building we were talking about today, but 100 years apart. The website has several others, all worth checking out. 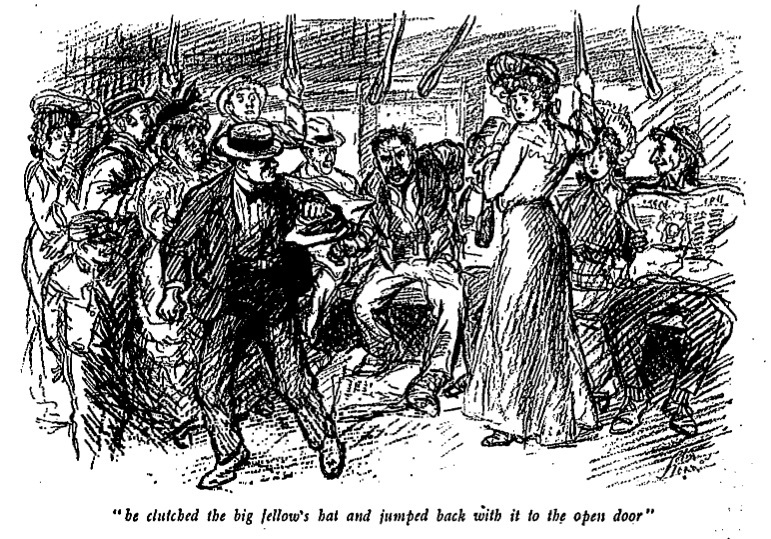 Sloan, along with his fellow painter friends Luks, William Glackens, and Everett Shinn, met at the PA Academy of Fine Arts and began their careers working in Philadelphia newspapers as “artist-reporters.” All of them ended up in NYC, where they worked as comic-supplement artists, illustrators for magazines and newspapers, and painted, focusing on scenes of urban life. Sloan went on to become the art editor of The Masses, where he worked closely with Max Eastman (and his wife Dolly served as business manager); later he taught for many years at the Art Students’ League. In reading his diaries, I’ve been a bit overwhelmed with the quantity and range of geographical references, so I am hoping to use the Historypin platform to, well, help pin down Sloan’s peregrinations to begin with, and through his associations with other artists, editors, journalists, and writers, begin to trace the network of associations that held together a group of “culture workers” who until now have only been studied as individuals or within their respective cultural “fields” (painting, comics, illustration, journalism, fiction, editing). Looking forward to doing lots of walking, exploring, and taking pictures of my own & will pin what I find. Whether or not her references were as complete as they could have been, I absolutely loved the excerpt from Aurora Wallace’s Media Capital. What I found most fascinating was her depiction of the teleautograph (a precursor to the fax machine), which was used to project news onto canvases attached directly to the facades of news buildings in Park Row (literally, bulletin boards). 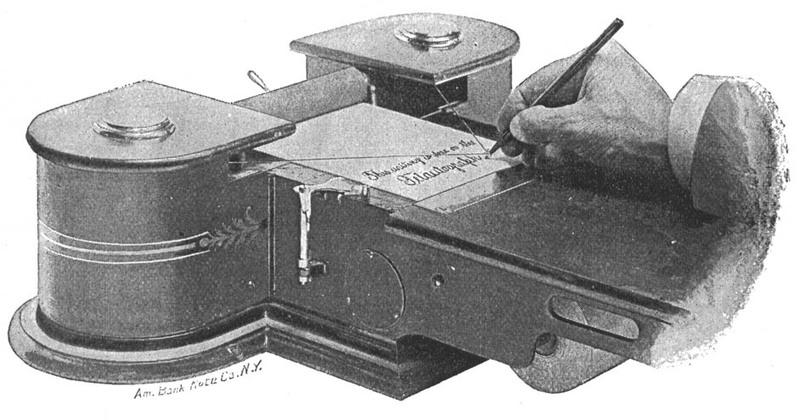 A teleautograph machine with operator. 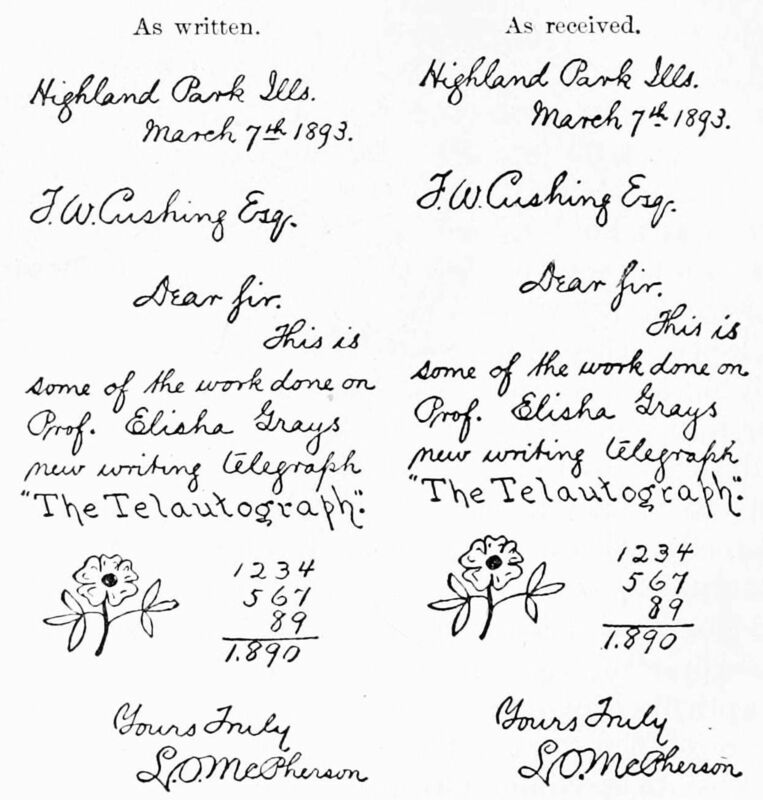 Sample teleautograph images: the original, and the transmission. I’ve been increasingly dissatisfied with the term “print culture” as a category of analysis in periodical studies as well as cultural studies generally, because I find that it does not successfully capture what is going on in the world of media and culture (certainly in the 20th century, but even in the 19th). In my own work I see interconnections between text/print (and text that is not printed), image (both printed, like halftones, and not, like paintings), theater, and things like technology, which have much to do with print but also affect one’s perception of time and light, for example. Wallace’s description of the teleautograph and the news bulletin boards shows the interconnection between text, image, news, theater and spectacle, and even geography and architecture. It’s a great example of how we need to think not just about the City of Print, but more … I suppose “Culture” would encapsulate everything I’m thinking about, but obviously that’s too broad a category. Even more than Scholes’ notion of the “hole in the archive” constituted by missing covers and advertising pages in magazines, how do we account for non-print and non-textual elements of periodical culture? Certainly these bulletin boards, developed by the newspapers and disseminating news, are part of periodical culture even though they are not print? I was struck by the last couple pages of “The Rise of Periodical Studies,” where Latham and Scholes argue for a collaborative model of periodicals scholarship, which they liken to the scientific laboratory. They suggest that the difficulty in establishing “humanities labs,” as they would have it, results in large part due to the persistence of the idealization of the humanities scholar as individual genius, cordoned off in the garret. In trying to figure out exactly what this whole “City of Print” thing is, which the (you) organizers seem to have decided to mete out in tantalizing bits and pieces (what? we’re making maps? huh? we’re annotating a novel? seriously? we are really supposed to read all this stuff before we even get to NY? ), this essay more than anything else crystallized for me one of the things I’ve been struggling with, and perhaps it’s something that others have been struggling with as well. Simply put: it’s hard to share. Yes, agreed! But it’s still hard to share. P.S. I notice that my posts are labeled with my WordPress username, which is just my initials, JLC, standing for Jean Lee Cole. I should have shared that from the outset!